I quite enjoyed this book. Though after all the praise I have read that was heaped on it like frosting on a 27 layer cake, I expected to be blown away by it. I was not.That in no way implies that this is anything less than a very skillfully constructed first novel by someone with a true talent for storytelling. This is exactly what this is: a recasting of folk tales, village lore, and the trauma of war. And it is artfully done.It is a story of the -less, the deathless, the voiceless, the nameless, etc. It is the story of how secrets are shared and truths stretched. In some families say an uncle is the one who storytelling falls to. In Natalia's family everyone tells stories. But most of all, everyone else tells stories about them. Each of them are connected to the myth and legend of their unnamed Balkan city and the villages/towns the originate from.And from these stories bursts forth a mystery of why and how someone came to die in not a nameless town, but an unknown town. And this mystery is so enticing that as you navigate it, the stories told do not seem connected, you want bigger clues than metaphors and similes. You want fact rather than semaphore. But by the end you are glad you wrestled with the folklore to navigate the tributaries of thought going on within. It makes it far more rewarding to see the whole story after you have assembled it via story fragments into a whole cloth.At times I feel that Obreht was trying to reweave Yugoslavia back together with her stories and this is where I found her most difficult and her writing frustrating. Frankly, I do not think she set out to do this, but this is how her nostalgia in her stories at times comes off. I think she was attempting to demonstrate how new borders can not confine these stories, any more than the page. I think she was trying to show the ways the endless conflicts are a narrative into themselves that all sides share, just like the land that was once one. But I feel she was not especially successful in removing the gaze of desire from the past -- the it was so much better then.... -- from her nostalgia. 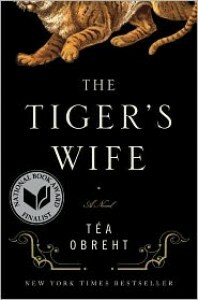 And perhaps that is a fault of the nature story telling alone, but it still makes reading these passages difficult and feel a bit like a regression the rest of the book was so steadfastly opposed to.That said, I really enjoyed the book.Also, this is a call to all other novelists: more tigers within your stories please & thank you!